Former Justice T. Frank Hobson was the 48th Justice on the Supreme Court. He served from 1948-1962. He grew up in Jacksonville, attended several schools and graduated from Wake Forest College in 1922 with his bachelor’s degree. He went on to Stetson University College of Law and earned a Bachelor of Law in 1924, was admitted to the Florida Bar, and began practice of law that same year. He was appointed to the Sixth Judicial Circuit Court, in Pinellas County, in 1928, where he served for 20 years, with distinction. 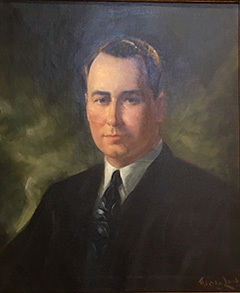 In 1948, Hobson was appointed by Governor Millard Caldwell to fill the unexpired term of Justice Rivers Buford. Later that year he ran successfully in the Democratic primary and in the general election for the seat. He was re-elected twice more. Though Hobson was voted chief justice in 1953, he experienced severe health problems and chose to relinquish the high-pressure job, returning to his accustomed role as justice. Health issues persisted, prompting him to finally retire in 1962. County Judge: Yes. Circuit Judge: Yes.